Well, we’ve had another birthday in the family. Master 5 is now Master 6 and once again, the birthday was not as one would normally expect birthdays to be. A month or so ago, we had really been looking forward to this birthday. Last year’s birthday saw him blowing out candles for the first time (well, spitting, but it still counted) and at Christmas time he was actually mildly interested in presents. A couple of months ago we had speech for the first time, consisting of some echolalia as well as putting together three or even four words in phrases or sentences. He had been very engaged with us, was happy to spend time with us and play together. It was going to be great. Of course, that’s not what it was. The most recent episode of PANDAS has taken all that away from us. The words have gone, he is no longer pointing, he is only rarely engaging with us or interested in anything other than swinging or shredding. He’s not wanting to eat again, and now he’s not wanting to drink much either. He cycles from screaming, raging fits with lots of throwing, pushing and shoving, to sitting quietly for a few minutes, while watching TV and perhaps singing a phrase of the song Playschool is singing. On the morning of his birthday, he was NOT in a good mood. We carried on despite him, hoping that he would improve. In desperation I gave him a dose of Ibuprofen – it helps to calm him down, but I can only give him one dose, any more than that and he reacts to the additives by getting foul, uncomfortable diarrhea. We’ve now ordered compounded Ibuprofen and it’s not cheap. Nothing is on this journey. 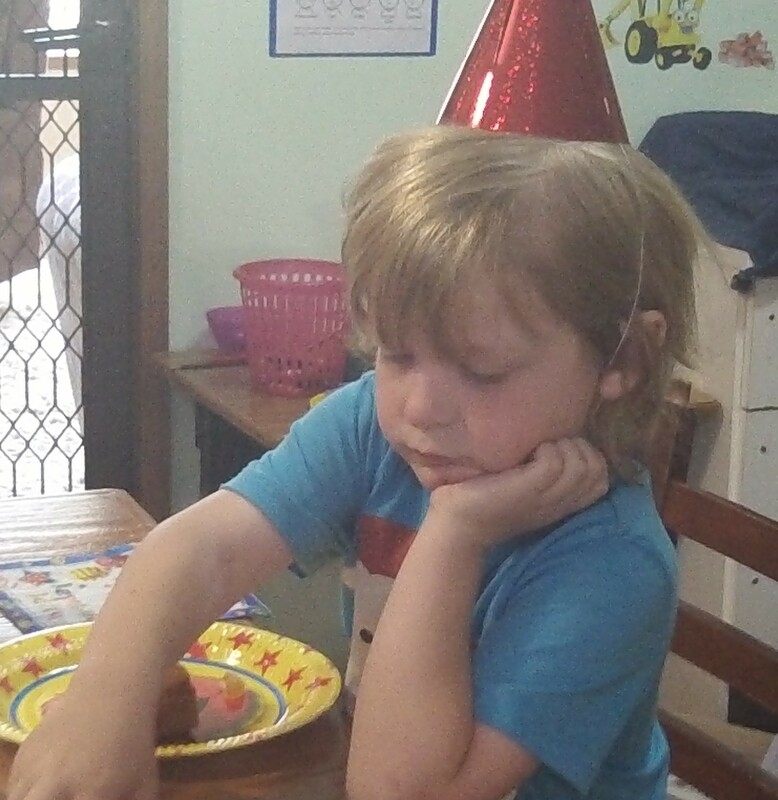 The birthday party actually went well – he happily took one bite out of each cupcake, refused to eat the cake at all, and ate a few lollies (yes, I know it’s bad for his yeast). He insisted on wearing a party hat (for three days), and did not mind the noise from the party poppers (one of his sisters did though). He still doesn’t open presents, but once the wrapping was opened and I gave him a quick preview of what was inside, he would then be happy to look at the presents. His beloved playbuddy came along to help us celebrate and gave him a treasure trove of stickers, which is another fascination he has developed. I don’t know which is worse – the paper covering our entire floor, or the stickers stuck on walls, furniture, floors and even the television. My new mantra has become, “think of the fine motor skills practice he’s getting” while I’m scraping yet another sticker off the floor. Usually birthdays are a time to celebrate another year of growth and achievement. As parents we would look back over the years and see how far our child had come, and wonder what marvelous events the future would bring. When severe Autism enters your world, that is often not the case. You tend to focus on what the child still can’t do, what things they have not yet learned to do in comparison to other children their age. This is particularly so if you have a birthday party with children of similar ages to your child – the differences can be astounding. Our reality is, that when our son was assessed at 32 months of age, his skills were measured at being from eight months to 22 months of age. At best, his development was only 10 months behind his chronological age, at worst, it was 24 months delayed. He ranked in the 1st percentile for every single category – this means that 99% of children his age were able to perform better in those areas than he could. I cried for two days when I read the report. We have spent over three years changing his diet, paying for Biomedical Doctors, Homeopaths, General Practitioners, Pediatricians, Speech Therapists and Occupational Therapists. The latter two for only a short time as he was simply too delayed and too inattentive to be able to do the therapy. For most of that time we saw a therapist for Relationship Development Intervention (RDI) and even though we can no longer afford to see her, RDI has become our lifestyle. We have paid for blood tests, urine tests, stool tests and hair testing and spent thousands of dollars on various supplements. I have paid more for books, courses and even webinars to help me learn how to help my son, than I have ever spent on my own clothing. Where are we at after all that hard work? We have a six year old son who has ADHD, mitochondrial dysfunction, severe bowel dysbiosis, PANDAS, suspected Cerebral Folate Deficiency and is an undermethylator with a suspected MTHFR mutation. Not to forget severe Autism with Developmental Delay and Intellectual Disability. After three years of hard work, very little sleep and a lot of tears, we estimate that developmentally, our son is at an average of 2 years of age. Some skills he has increased in, and others have not really changed. He is now an estimated four years behind developmentally. 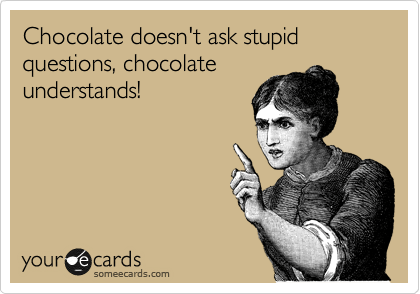 This explains my need for the comfort of chocolate. All around me, I see friends who are struggling with their children with Autism. Nearly all my friends have children with Autism – mostly because they’re the only ones who can understand what we’re going through, who can offer a word of comfort, make a suggestion for what else to try, and be there to have me cry on their shoulder, or for me to offer my shoulder in return. I remember the first local Support Group meeting I attended – one of the mothers was talking about their friends, “well, the friends we have left anyway”. I looked at her strangely, but it doesn’t take long to find out that other people just don’t understand. They don’t understand your struggles or those of your child, they feel uncomfortable around your child and you, and don’t really know what to say. When you throw yourself into the world of Autism recovery, a lot of other things become meaningless, so it’s hard to make polite conversation when you’re really wondering why on earth your child’s poop is once again such a strange colour and smell. The friends I have now are happy to talk about poo. My friends are also having tough times in their marriages. When you’re sleep deprived, broke and fanatical about healing your child, relationships tend to take second place, or even third or fourth. Usually, one partner (most of the time it’s the mother) spends their entire time taking care of the children, doing therapy at home, conducting research that rivals that of a PhD student (with no holidays or graduation however), finding new therapies to try and therapists to see, working with educators who haven’t got a clue about Autism let alone how to manage it in the classroom, or homeschooling their child simply because school is far too much for a medically fragile child to cope with. If you’re tired after reading that really long sentence, just try and imagine what it’s like to live it. Every, single, day. On a far too regular basis, my facebook newsfeed assaults me with stories of mothers who couldn’t take it anymore. Mothers who sought help from one doctor after another to get some relief for their child’s very real medical issues. Mothers who were told time and again that “it’s just Autism, there’s nothing we can do” about their child’s chronic constipation and/or diarrhea, their obvious pain, their lack of sleep, their self harming and injuring others. Those mothers were desperate, no doubt extremely tired and worn out, but with no end in sight for the suffering that their children were going through. Most of them had no support financially or physically, and no relief from the constant, draining needs of their child. They did the unthinkable – they took the life of their child. A child they once would have smiled down on with all the pride that only a mother can have for her newborn baby, a child whose first steps they relished, whose toothless giggle they recorded on video tape for all the world to see. What will it take for the world to wake up and realise that Autism is not just a different version of normal? That there are times when Autism is more than any one person should bear, than any one family should have to deal with alone? Where are the volunteers who give out free cups of tea to mothers who are at the end of their rope? Where are the organisations collecting money to pay for the therapies our children need and most of us can’t afford? Where are the church members who will gladly look after your child regardless of their needs, so you can refresh yourself by coming to the house of worship? Within the next ten years, there will be very few houses who do not have a child with Autism – the projected rate is 1 in 2 US children, and Australia won’t be far behind. Some of those children will never learn to use the toilet, may never speak, may need restraints to stop them from harming themselves and will need care for the rest of their lives. What will our families look like then? Martina can anybody mind the children while you have a break, or are the problems too complicated? you shouldn’t have to bear all this on your own! Friends, rally around and help this dear woman!! 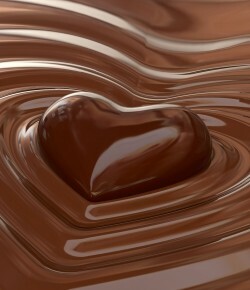 Even if only to listen and care, and make her a cup of tea.